English: Say "I Love You". Friends will only let you down—that is the sad truth Mei Tachibana lives with, ever since she was wrongfully blamed for the death of a class pet by her so-called friends in grade school. Since then, she stays away from people in order to avoid ever being hurt again. However, Mei's life begins to change drastically when a misunderstanding in high school causes her to encounter popular student Yamato Kurosawa. Yamato finds her intriguing and insists on being her friend, even though Mei wants nothing to do with him. But when a dangerous situation ends with Yamato kissing Mei to save her from the unwanted attention of a stalker, Mei begins to develop feelings for him. On the heels of her discovery that their feelings are mutual, they start dating and she gains not only a boyfriend, but friends as well. Mei, however, finds it very hard to adapt to this new lifestyle, especially in expressing her true feelings towards Yamato. Throughout misunderstandings of their new relationship, each other, and the attentions of other girls, Mei and Yamato slowly grow closer and learn the true meaning of those three little words: "I love you." Sukitte Ii na yo. is licensed by Sentai Filmworks for release in North America. The anime adaptation was followed by a live action film adaptation that premiered in 2014 and earned over ¥1 billion (around 10 million USD) at the Japanese box office. Adaptation: Suki tte Ii na yo. Oh how I wanted to say, I love you to Sukitte Ii na yo... but I just can’t because you’re a flat two dimensional romance that just didn’t live up to my expectations. It really is a shame, because Suki na yo had a tremendous amount of potential and gave us some things we don’t often get to see in the romance genre. But as the series winds down I found myself lamenting what could have been. It’s hard for me to be too hard on the romance anime plot premise, I mean they have pretty much already all been done before and they are all mostly silly as well. Suki na yo is no different, with the unlikely story of the hot and most popular guy in school falling for a shy, friendless loner who kicked him down the stairs because she mistakenly thought he flipped her skirt. The beginnings of true and lasting love if I ever saw it. The girl Mei, and the boy Yamato, both have some interesting personality issues on the surface and despite the silliness of their meeting there was some enormous amount of potential in their relationship. However this is sadly mostly wasted over the course of the story. Now here is where Suki na yo is a bit different from its other romance cousins. For the most part our lead characters are in a relationship together from the beginning to the end of the series. The typical format is 99% courting with the eventual payoff at the end when our little lovebirds finally realize their mutual affections. While it can often be frustrating when it is drug out with silly misunderstandings and character cockblocks at least by then we have a clear understanding why they both love each other. The show is called Say I love you, but it should probably more aptly called Say why I love you. Even though I have some pretty serious complaints about the way the shows romance and plot unfolds, I can’t say I didn’t enjoy watching this series. But when you compare it with its peers within the genre and even shows that were airing during the same time as this, it comes across as distinctly average and ordinary. Much in the same way as the story is underwhelming, so are the series main characters. A romance is by nature very character driven and if we don’t get compelling leads it’s pretty difficult to care if they end up falling in love with each other. Mei is your standard "everyman" kind of girl typical in shoujo romances. She’s cute, though not particularly beautiful, and pretty much average in every other way. She’s a nice girl with a strong spirit but very vulnerable as well. Exactly the kind of girl most people can relate too and can root for as well. It’s sweet how she slowly comes out of her shell and makes friends and learns to trust people again as well. Even though this mostly comes across pretty corny and clichéd. Though hell I like corny and clichéd anyway. Yamato is less interesting and in many ways is also your typical bishounen leading man. Though I will give him some credit for breaking the trend and not being a cold, aloof, and unfeeling jerk. You get the feeling most of the time he has genuine feelings for Mei but at other times he’s actions around her seemed to be a bit condescending and they he was treating her more like a pet and as an equal partner. I felt some aspects of his personality were also very inconsistent, especially later in the series. For a guy who came across as supremely confident he was surprisingly weak willed at times and his distrust of Mei's feelings at times was implausible considering what the pair had been through to that point already. The supporting cast is the weakest link though and stereotypical shoujo fair. This plays in to the weakness of the plot but basically the same themes are repeated multiple times over the course of the story. Girl appears, of course hopefully in love with Yamato, drama unfolds, girl is rejected and our leads love continues. And the rejected gets new love and becomes best friends with our dear Mei. While I mostly liked the supporting characters they simply lack the depth for them to be actually interesting. Then of course you have to look past the unlikelihood that two romantic rivals are going to be besties afterwards, particularly when one side was involved in some pretty nasty schemes and bullying. Despite all these flaws though what Suki na yo really does best is both its artwork and musical soundtrack. Both are typical of the genre but I really did love both of the songs. The seiyuu cast is comprised of mostly veterans but none of them are real stars. I thought they did solid, if unspectacular work. While the artwork may not be a masterwork, it is very fluid and reality based, with clothes and body types that stay in the realm of possibility. Even though in the end I have quite a few complaints about Suki na yo, it’s still a good watch. If you’re really starved, as I was, for a romance anime with a sweet ending and are not demanding to be shown some that’s never been seen before then you should have a good time with it as well. You're an individual who has a troubled past. You have been ostracized by various circumstances and nowadays, you don't give a damn what anyone thinks about you or your life. That is till you meet one of the hottest student at school who takes an interest in you. Your heart pounds and for the first time in your life, you give a damn about your life and those around you especially regarding that student. That, my friends, is where Sukitte Ii na yo shines. It's a discovery and it's a classic. Sukitte Ii na yo (also known as Say "I Love You".) is an anime series adapted from the manga written by Kanae Hazuki. The animation studio, Zexcs handles its production which is already known for some of its past works in the romance department such as Da Capo, Fortune Arterial, and H2O: Footprints in the Sand. The series fits within the romance and drama side as opposed to a pure romantic comedy because of the story involved. Like I mentioned before, the series is a classic for those into the shoujo medium. It is like a breath of fresh air to watch especially with the lighthearted backgrounds presented. For those into some school drama involving the typical high school life, it's like a journey all over again. The series kicks off with a girl named Mei Tachibana. She is nothing special although she used to get well along with others. Unfortunately, it seems that events in the past has shut her down and made her an unsociable person. In fact, classmates who knows her describes Mei as a girl who keeps to herself with little words and a person stuck in her own little world. Yet at the same time, we can see Mei as an honest girl who is caring, loyal, and willing to help others when the time calls for it. But time isn't always on her side especially during a day when she bumps heads to heads with the most popular student at school. Here's where the drama kicks in and his name is Yamato Kurosawa. Yamato is one of the most popular guys at school and his name may even suggest a male version of Yamato Nadeshiko (no pun intended). He meets Mei in a very unusual way at school and later on so helps her with a problem involving a stalker. Yikes! Now, from there on and out, the two forms a bond despite Mei's stubbornness. Now, the duo seems to very incompatible at first glance. I mean, Mei is one of the most plain looking girls at school with a plain way of dealing with her life. On the other hand, Yamato is the most popular guy at school who is idolized by many of the students. Sounds like living on the opposite of the world, right? Yet, what these two individuals share in common is their willingness to take on life itself with their ways of helping others and discover themselves. It's a pleasant watch and a rare gem we don't see too common in today's shoujo theme series. Later on, Mei and Yamato forges a relationship that seems to get quite the attention. I honestly think the duo are quite compatible that balances out each other. We know that Mei is a plain looking girl who is clumsy yet very honest with herself and with others. Yamato often goes out helping his classmates as well by putting others above himself. We can see that he dislikes people who just likes him for his appearance. When Yamato realizes that Mei likes him beyond just his physical appearance, the two becomes quite compatible. Although loathed by some of the other students at school, they are a good match. The other characters also plays their roles in the story as well that often brings forth new surprises and obstacles to the couple. That brings for the drama into the series. On the male side, we have Kai Takemura who has very similar circumstances with Mei. Both of them had a past they wish they can forget but they manage to move on. After their encounter, Kai becomes part of the love triangle between Yamato, Mei, and himself. It's drama to the D especially when we see Yamato's jealous and defensive side. On the female side, there is Megumi Kitagawa. She is seen as an idol on similar status with Yamato and is possibly what Mei wants to be: popular and beautiful. Yet, we see behind that outer shell is a very insecure girl who seems sweet but is only aiming at her own goals, aka Yamato. The three of them is a love triangle that makes Mei once again examine herself and the relationship she forms. The overall execution of the series follows that typical shoujo theme ways of portraying its ways, settings, and backgrounds. As such, expect some cliched and predictable moments especially between the duo of Mei and Yamato. Even from the pilot episode, it can be easy to tell where the direction the two are heading. The misunderstandings and some of the drama are also easy to see through especially involving Megumi. It's no surprising either that in high school, all sort of situations happen and love is may just be one of them. The series takes that love between the duo and drives it throughout each episode as obstacles and events are presented. It shows how much they discover themselves and how much they can change when they understand each other. The artwork of the series is quite realistic and portrays the backgrounds with the school life setting. The various classrooms, playgrounds, and characters are real and needs to be in that way to convey to the viewers what high school is all about. Yuka Hirama (the art director) does a wonderful job of that crafting the characters. Mei is painted as a plain looking girl. Yamato is painted as cool looking guy. Megumi is painted as a school idol with a beautiful figure. Kei is painted as a guy that used to have a rebellious nature. It is all there and the audience can see how each of them fits within their boundaries within the artwork department. Similarly, the soundtrack of the series is lighthearted. Although not too well known, Yuuji Nomi engineers the series' music with his skills to create a sense of being there. It's nothing too special because it mostly is lighthearted and hardly noticeable at times. However, it is a sweet melody that depicts the settings and the characters especially the opening song. "Friendship ~ for Sukitte Ii na yo" by Ritsuko Okazaki is a very lighthearted song that gives off that melody of sweetness which depicts the duo's sweet relationship. Similarly, the ED song follows the same suit to match the lightheartedness of the series. All in all, Sukitte Ii na yo is a pleasant series to watch. The relationship between Mei and Yamato is quite warming and realistic to what some of us may have experienced during our teen years. It's heartwarming, sweet, and at the same time has drama to it especially involving the other characters. It is also a shoujo that fits within its boundaries without going over heels or trying too hard. Ultimately, it's a rare little gem that deserves praise for its beauty. Sukitte Ii na yo was my first romance anime to watch and I decided to write this review in order to convey to you all of my thoughts about it. Well, when I was watching the earliest episodes, I thought it was really underrated. There are many out there that don’t really like it (and I’m talking about girls certainly) and that was always leads it to be given really unfair ratings. Well that’s exactly the problem with romance animes. Their stories redound to become mainstream and that’s why they don’t appeal much on their viewers, so that makes them complete them without considerate them as a big deal. But here we have something special. A HUGE deal, actually lol. So, let’s start from the basics. We have our typical social-awkward girl and the popular hot guy who falls in love with her. Of course I was like “awww” when hearing the typical love words and stuff like “you’re my everything”, but what I liked more was the participation of the other characters in the story. I mean, watching a couple doing stuff all over the anime is totally boring. But here, you will see development in the characters. They will narrate their different pasts, their different stories and reveal sad truths and facts about them. So, there were some life lessons as well. Trying hard to be accepted by the others -so much that you harm yourself, overcoming your fears, the meaning of friendship, be envy of the others, isolate yourself. All these applied on the characters making you enjoy the show as you see how relations between them are being developed. And I think that was actually what made me curious about the next episode, watching it right after the previous ‘cause I just couldn’t wait at all :P What I also liked was the way that characters showed up in the show, leaving you more curious and making you wanting to “explore” their personalities and find out their connection to the rest of the characters, as well (which was an another strong point of the anime). So, about the “romantic” side, I have to say that I really liked it. You can clearly see what love really means, what love really is just by how the relation between the two main characters is developed. And this anime taught me that love has to do with completing and dedicating completely to each other. Hahah, and I’m putting aside the cute main character, our loving Yamato. Sukitte Ii na Yo was a decent romance anime. Not too girly nor boring and totally NOT stupid at all. It can keep you stuck to it until the end through its great love story, the shapely art, the variety of the characters and the zestful relations/connections between them. Where do I even start with this anime. The title even gives off an exceedingly romantic, unrealistic atmosphere. If there was ever a competition for "The Most Generic Shoujo," Say 'I Love You' would take the cake. Let's start off with a brief summarization. 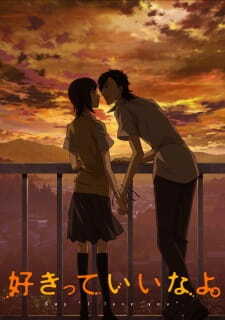 A reserved young girl who has no social connection whatsoever plays as the object of desire for the most popular, handsome boy in the school. They eventually establish an awkward relationship filled with uncomfortable dialogue and well, there you have it. There really isn't much else to say about this anime. It's simplistic, it doesn't try to break any boundaries, and it's so monotonous it will probably make you yawn and fall asleep. It executed what every romantic comedy anime out there has ever attempted to accomplish. I can guarantee that you have seen this same template numerous times before, and I can also promise that you have seen better. The story is generic and monotonous. It does not bring anything new to the table that makes itself memorable, or leave a mark behind in history. You can summarize the story in one sentence, and the reader could predict everything that will ever happen in the anime. Is there any completely unexpected plot twist? Is there any cliffhanger that leaves you at the edge of your seat? Or maybe there is some sort of symbolism, or undertone that it is trying to portray. The answer is 'no' to all of your questions. The story is basically a silly, happy-go-lucky, simplistic romance that has been repeated too many times before with absolutely no depth whatsoever. The pacing also made me uncomfortable. First episode they meet, second they kiss, and third, they automatically become a boyfriend and girlfriend. It's immature and childish, and definitely does not represent the singular theme they have been emphasizing throughout this entire anime, which is indeed 'love.' The storyline was just another contribution to why I find Say 'I Love You' so bland. The art is satisfactory. It doesn't do anything extraordinary, but it certainly isn't disgusting. The somewhat likable character design, and the brightening colors that were incorporated into the background scenery was what gave its' animation a semi-respectable score, and I am sorry to say, is the pinnacle of this anime's accomplishment. Other than the sparkle and the twinkle that they sprinkle and sugarcoat in every single shoujo anime, Say 'I Love You' does not outdo any other anime with its' art. To wrap it up, it does its' job, and with the wide variety of spectrum the animation studio ventures into when they bring this anime to life is a compliment I am reluctant to give, but I will just for the anime's mentionable work. The soundtrack of Say 'I Love You' is almost like a lullaby. It puts you into a slumber, and makes you wonder whether Say 'I Love You' is supposed to make you fall asleep or make you giggle and laugh over the chemistry experienced throughout adolescence. The opening theme is a heartwarming hymn, but certainly isn't anything special. It's calm, collected, but definitely doesn't introduce the romantic aspect of Say 'I Love You', but gives you a more wistfully composed orchestral piece. The quiet piano and violin strumming away in the background is soothing and gentle, but it just didn't break a barrier or kick down a wall for me. The ending theme is practically an identical twin to its' opening theme counterpart. The OST? More whimsical singing, making me picture it to be more of a children nursery rhyme than a love song. In conclusion, the sound? Nothing remarkable. But still bearable. The characterization throughout Say 'I Love You' is most likely the worst part of this anime. The main female protagonist is timid, reserved Mei Tachibana. Her introduction actually somewhat drew me in-- an anti-social, pessimistic student who doesn't believe in establishing relationships with her classmates. This really hooked me-- I wanted to know more about her perspective on the everyday boundaries of school life, and her thoughts/opinions on social hierarchy, interactions, etc. I also really liked it when I noticed the courage she possessed when she gave the most popular boy at her school a roundhouse kick in the face! But then this bright, intelligent, and audacious young woman that I believed had such an interesting view on the world suddenly transformed into your ordinary tsundere character who would never respond to the male protagonist, Yamato Kurosawa's affection. Which brings me to my next point. Yamato Kurosawa has got to be one of my least favorite characters in Say 'I Love You." He is perfect, almost robotically so. Yamato Kurosawa, the academic all star, the athletic champion, the wealthy son of a successful family, and on top of all that he has a beautiful face and a social life. Which is what makes him so monotonous to observe as a character. I didn't like how there wasn't anything wrong with him. He is a human, not an alienish demigod who excels at everything he does. I also didn't like the sudden fluctuation between his interest in Mei. First he is all over her, his top priority, the one individual he wanted to see and spend his time with, and then all of a sudden, he almost forgets her. The process rinses and repeats like a cycle. Neither Mei Tachibana nor Yamato Kurosawa did their role as the main protagonist justice, not even decently so, which is why the score they have received is so long. It would have been even lower if Mei Tachibana's introduction wasn't so solid. This aspect of Say 'I Love You' was yet another factor that made this anime so disappointing. Alright, I will admit it. I don't usually watch shoujo anime. Yes, I have seen a lot of excellent shoujo anime, and I have seen a lot of completely gagworthy shoujo anime. Say 'I Love You' to me is just a mediocre, soap opera fling. It is a decent anime to watch if you want to completely turn off your constructively critical brain, and just enjoy a romantic comedy. But that does not forgive the English bran muffin of a storyline, and the disastrous characterization. Say 'I Love You' has done everything that has already been done, and if not worse. I certainly did NOT enjoy this anime, and this is coming from a female adolescent, which I believe is Say 'I Love You' 's target demographic. It claims itself to be a romantic comedy slice-of-life. But I did find the relationship that Mei and Yamato shared to be romantic, but more awkward, prepubescent, and coming-of-age. The most that Mei and Yamato did was hold themselves in an uncomfortable embrace, or a sudden kiss here or there. In my opinion, an adolescent attraction is not what love is, and if you haven't noticed already from its' title, is what this anime is trying so hard to emphasize. It claims itself to possess comedy, and will promise laughter. But the jokes that were displayed only put a halfhearted smile on my face, because well, I can't put it anymore bluntly than it wasn't funny, and definitely didn't provide any entertainment for me as the audience. It does what it's supposed to with its' slice of life genre, which isn't all too interesting to witness anyway. You have your high school, identical uniforms, and handsome/beautiful boys and girls. Nothing ever happened, nothing ever happens, and nothing ever will happen. Say 'I Love You' just wasn't for me. And with that, I give it an overall score of 4 / 10. Shoujo is one of the most recognizable genres in anime world... but how much do you really know about it? Is it really just about high school romance aimed at young girls or perhaps there is more to it? Let's learn more and take a look at 15 most popular shoujo anime on MAL!